It's never too early to start planning things to do in summer in New York! In fact, most of Gotham's most popular summer events (i.e. 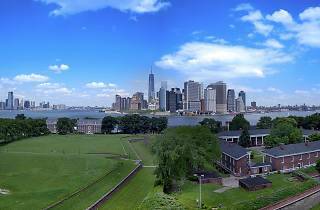 outdoor movies) are already in-motion, and special warm-weather attractions—like Governors Island—are now open for the 2017 season. 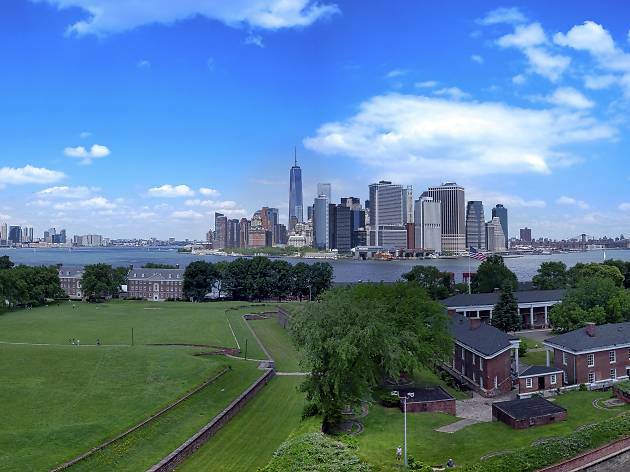 Speaking of islands, we can't think of a better getaway than taking the ferry to a car-free oasis off the New York Harbor or East River. Since summer is the best season for things to do outside, we've taken the liberty to list a few can't-miss events taking place at either a local island (or floating park). More of an indoor kid? Don't fret—we've found some awesome, AC-guaranteed events for you. Can’t afford a tropical vacation? Hitch a ferry to New York’s car-free island, and once you’re there, get a tan as you chill in one of its hammocks. But it’s not all about taking a load off here. After launching the appropriately named 10-acre park the Hills last summer, GI continues to expand with exciting openings of attractions like Island Oyster (a beer garden from the Grand Banks team, serving seafood and cocktails) and Adventures at Governors Island, a new recreational facility with a climbing wall, maze and zip line. Tried-and-true events such as the 1920s banger Jazz Age Lawn Party (jazzagelawnparty.com; June 10, 11, Aug 26, 27; $45–$325) are not to be overlooked either. Ferry information at govisland.com. Islanders of all ages can bring a blanket and pack a picnic for free movie nights starting May 28. The park projects flicks such as Sister Act and Fantastic Beasts and Where to Find Them on a giant screen. Art lovers can peep—and actually touch—the works on display during the outdoor exhibition “Flow.17,” which features interactive projects by Bronx Museum artists. There’s also gratis yoga along the water and excellent bike and running trails for those who want to maintain their summer bod. Ferry information at randallsisland.org. This mammoth farm debuted last June, allowing visitors to discover the joys of sustainable living while nabbing fresh (and free!) produce. Now, with an updated look resulting from Swale’s collaboration with Strongbow Hard Apple Ciders, the barge has transformed into a floating apple orchard and garden that sails on the waters surrounding Manhattan through June 30. Get your hands dirty and pick veggies like asparagus and Swiss chard, which grow on the 80-foot-long wetland using filtered water from New York Harbor. Free groceries aren’t the only draw: The park also plans to host panels, screenings and pop-up dinners. Pier 6 at Brooklyn Bridge Park (swaleny.org). Can't stand the heat? Here’s where you can nerd out, get cultured and stay cool in AC this summer. Instead of soaking up the sun, absorb some culture at the largest dance celebration honoring African heritage. This year’s theme is “The Healing Light of Rhythm: Tradition and Beyond,” and the fest includes performances by hip-hop crew Illstyle & Peace Productions, New York City’s Forces of Nature and the high-energy drummers and dancers of Asase Yaa. They should get your rump moving in your seat in no time. Brooklyn Academy of Music, 30 Lafayette Ave (718-636-4100, bam.org). May 26–29; $25. At this popular live-magazine event, fascinating writers, filmmakers and photographers tell their stories, which are accompanied by stunning videos, animations and other visuals on a giant screen. This season’s NYC edition includes Girls writer Yassir Lester, photographer Gillian Laub, This American Life’s Karen Duffin and Rolling Stone’s Brittany Spanos. The Town Hall, 123 W 43rd St (212-997-1003, popupmagazine.com). June 8, 9; $37–$57. This precocious little girl has made a big impact on New Yorkers after all of her adventures at the Plaza Hotel. In celebration of Eloise’s 60th anniversary, New-York Historical Society honors the beloved fictional character as well as the series’ author Kay Thompson and illustrator Hilary Knight, in an exhibition showcasing original manuscripts, sketchbooks, vintage toys, photographs and more. 170 Central Park West (212-873-3400, nyhistoryorg). June 30–Oct 9; $20. Get ready to geek out during this three-day convention full of panels led by anime insiders like FUNimation Entertainment’s Tyler Walker, cosplayer Dokudel and actor Heather Walker. There are also vendors selling whimsical merchandise, and visitors are, of course, encouraged to dress in the wildest outfits of their (fever) dreams. New York Marriott Marquis, 1535 Broadway (libertyanimecon.com). Aug 18–20; $52–$60.